The Academy provides you the road map and support crew to help you everyday as you move from clinician and up the management rungs. Tap into the collective wisdom and experience of a community of clinical managers and experts who are there to support each other. Meet leadership experts and listen to their stories and pearls of wisdom. Become infinitely better at managing your team on a day to day basis, so that you have way more time and far less stress. What makes Clinician 2 Manager different? You are tapping into a Brain’s Trust of experience and expertise on all things clinical management! Our trainers, mentors, special guests – and a good proportion of our members are experts in their areas of leadership and management – and that is because they have been there! Their expertise is based on actual experience and augmented by research. Where others teach unproven theory or rely on outdated experience – we’re successful managers and leaders ourselves, we’re in the trenches with our fingers firmly on the pulse. You are joining a tribe of clinical managers who are part of the Journey Community – there 24/7 to answer all your questions and provide feedback and support. We will share practical tips and ‘how to’ on great tools and strategies that are working for our members. These quick ‘living case studies’ will give you a behind the scenes into other teams and organisations. We eat, sleep and breathe clinical leadership and management. We have completely committed to empower clinicians through empowered leadership. The Journey is our core focus and we love helping our members achieve success. It’s what we do, and we’re not going anywhere! Over the last 5 years we have been testing the materials across the health and aged care industry and have seen massive uplifts in competence, confidence and organizational improvements! The people who have been part of this journey have made a real difference not only in their own careers – but for their teams, their organisations and of course for the people they care for. Hi, meet the team behind the scenes and in front of the camera. Each of our team bring their special sauce and expertise based on years of experience, research and higher education qualifications. They have done the hard work, made the mistakes, and lived to tell the stories. You will see them popping up here and there – and if you are keen to accelerate your journey you can contact them to hold a Clinician 2 Manager session at your place or provide one on one mentoring. And don’t forget the special guests we will be interviewing – what they share is gold! We guide you step by step along the Journey, so you are not completely overwhelmed by all the content. 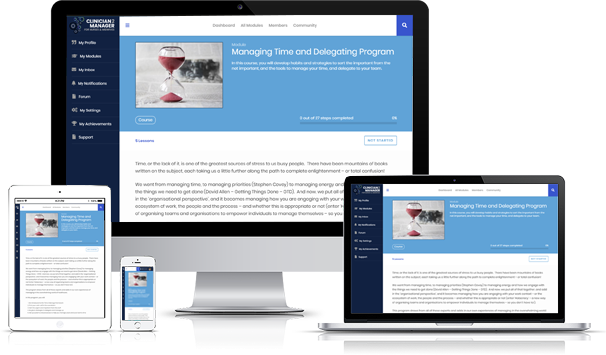 Each week you will be given access to another lesson which you can review in your own time and place and apply to your management practice – and life in general! By the end of your first year you will have access to all the content, lessons and tools you will need to accelerate your journey up the rungs, and you have this content for as long as you are a member on the journey. And don’t forget we are continuously adding content so this is your one-stop shop for all things clinical management and leadership. In-depth modules covering the essentials of empowered leadership and management. Prefer to learn on your own? The modules go into depth on the range of core competencies needed to be a high performing empowered clinical leader. The modules include videos, written content, tools and templates that you can use immediately in your work from managing conflict and people through to managing change and budgets. Each week you will receive another lesson from a module until you have completed each module when you receive a certificate of completion that you can use for CPD purposes. Here is a sneak peak of the modules you will get access to over the coming months. Looking for in-depth insights on specific tactics and strategies? Our expert interviews have you covered! We've assembled a cast of seasoned experts to share their expertise and experience on a broad range of topics from industrial relations, to handling the difficult personality, to preparing for your next job, making the transitioning from unit to organizational manager, or engaging with government and much, much more! We know the value of networking and sharing stories from the trenches. There is not better way of managing your worry and getting more sleep than having a community of trusted friends to call on and talk about your concerns, and get down to earth advice on how others have dealt with them. We have our Forums devoted to specific questions, and our community where you can dip in and out of to connect with people just like you. The practical advice, tools and exercises are meant to be applied to your own work context. Think of us as your very own consultant team where you can use the tools to design your own – budgets, performance strategy, change management plan, and lots more – and tap into our community and forums to test your ideas and thinking before you apply them at work and in life. Immediate access to modules that start your journey including The Introduction and Module One – Empowered Leadership. Every week you will receive another email giving you access to the next lesson until you quickly build up your own library of modules, tools and resources covering topics such as managing your time, people, resources and money, the best structures and processes for your team and clinical governance, leading change and managing continuous improvements, and more. Our community is the heart of the Journey and the place to go for all your questions, asking for feedback, gaining support and getting to know other like minded clinical managers and leaders. We may be biased but we happen to think our members are amazing with a whole range of skills and expertise, and they make the Journey forum an incredible resource to turn to 24/7. We will be interviewing a wide range of people who have successfully made the transition into management and empowered leaders to gather their insights and practical tips and strategies you can implement immediately. There is nothing quicker and easier than a template or check list to help you implement great management strategies. You will have immediate access to a Tool Kit where you can get all the resources discussed in the modules, by our resident and visiting experts, and shared by our members. Plus a lot more inside our resource library. When you join the Clinician 2 Manager Academy you are fully protected by our 100% Satisfaction Guarantee. If you don’t feel like you’ve received value and you decide you want to cancel any time within the next 30 days, just let us know and we’ll send you a prompt refund. No hassles, headaches or hoops to jump through. We’re confident that you’ll find The Academy helpful, and we won’t make you beg or invoke any silly rules or conditions – if you’re not satisfied within your first 30 days then we’ll refund you without any fuss. NOT SURE IF THE Clinician 2 Manager Academy IS RIGHT FOR YOU? Clinicians aspiring to become managers and want to understand the role and what they need to do to get that job. Beginning managers who want to side step the confusion and get the skills and tools to do the job confidently. Managers who want to fast track their journey to empowered leadership – and stop treading water. Clinical leaders who want to make a bigger difference, higher income, greater influence and freedom to choose their career path and their life - and are willing to put time and energy into making their leadership dreams a reality. Empowered people who are driven to make a difference and who take responsibility for their own development. Anyone who does not take personal responsibility for their own development and how well they translate new ideas and tools into their world. Anyone who is not open to new ideas and ways of managing and leading people. Anyone who wants to be spoon fed and not willing to apply their own critical thinking to translate this material to their own context. We drip feed the content in a sequence we have found least over-whelming and most helpful – but in the end you must apply and adapt it to your context. Anyone looking for a quick fix or not willing to dedicate time to their own management and leadership development. Becoming an empowered leader will take time and effort – you need to apply the lessons and tools. It might seem strange, us trying to talk you OUT of becoming a member – but truly if the Academy is not the right fit then none of us benefit. We have a vested interest in your success (you won’t stick around long if we’re not helping, right?) – and that all starts by making sure the Academy is right for you before you join. I am not yet a manager but keen to become one – is the Journey right for me? Absolutely - the Journey covers every stage from becoming empowered, learning the essentials of the role, through to managing your time, conflict, budgets and change – the core competencies you need to manage confidently. In fact now is the perfect time for you to join the Journey; as not only do we have training that will take you through each core competency, but you'll also be able to get support and advice from within the community too, to help you through your Journey. I consider myself a clinical leader but sure I want to be a manager – will this help me on that Journey? Yes, it will. As a clinical leader you want to influence others to follow your lead. The Journey is as relevant to you as it is to a manager because you will get the tools and insights that will build your clarity, confidence and credibility to convince others to follow you. Is all the content available straight away or drip fed? Not – not all of it. For the first 12 months, you will get access to one lesson each week, plus additional bonus content. The reason we do this is to help guide you in structured way through the core competencies so that you are not completely overwhelmed. The alternative will feel like drinking from a fire hydrant. But don’t worry, even if you don’t have time to get through all the lessons as we release them, you will always have access to them while you are a member. We regularly update and add new material too - so your content library will continue growing. Can I get one on one support or mentoring? 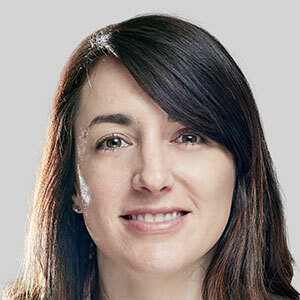 Not only can you ask questions and get advice, support and feedback any time from within our community, but we also run monthly live Q&A sessions, where you can pre-submit your questions for Elise and her crew, or even ask them live. On top of that you can tee up private mentoring and coaching with any of our accredited facilitator matching your need to their areas of expertise, at their fee for service. Why should I become a member now instead of waiting? If you want to receive the discount price for being a founding member now and for as long as you are a member, then you need to join now. Founding members can join for $27 per month, (or $270 per year and get 2 months free). This will go up to $37 per month ($370 per year with 2 months free) one month after it launches. AND - It's time for you to take action. Simple as that. If you really want to accelerate your Journey to Empowered Leader and enjoy the influence, freedom and better pay that comes with it, then you need somewhere to get answers to all of your questions - especially the ones you don’t know you have yet. You need support, community, and most of all... accountability! The Journey is that place. If you really want to make a difference, the time is now. I am already an effective manager, what can the Journey do for me? Assuming you want to keep growing as a leader, and expanding your influence and impact, and you want to keep progressing in your career, the Journey can support you make these next transitions. With each step up, we tend to slide down the competency and confidence slope. Each module applies regardless of where you are on your journey and challenges you to shift your perspective from where you are to where you need to be. A new manager will be focused on just learning what to do. An experienced manager will be more focused on how to do it – and an empowered leader will be focusing on how to build empowered people and systems to have it done – even when they are not there. And, if you are reaching the pinnacle of your expertise, then we invite you to take a transforming mindset and join us in interviews and activities that will build your profile and mentor others coming behind you! Yes. You will receive your welcome and login details. And you will receive notices when each lesson is available – look out for these on Fridays (it is perfect for grazing on over coffee over the weekends). All the materials are online – so you can dip in and out as you feel like it. What if I don’t enjoy the Journey? 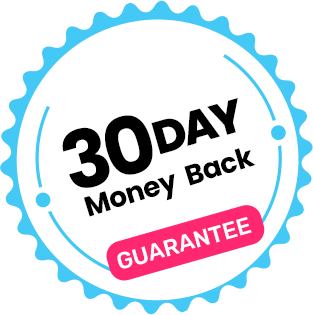 We know you will LOVE the Journey, however, if for whatever reason you're not 100% satisfied in any way we have a 30-day money back guarantee (no questions asked). We want you to succeed, and know that if you become a member of the Clinician 2 Empowered Leader Journey and really put your heart and soul into it… you will see amazing results! But of course, you can leave anytime. Obviously, we'd love it if all of our members stuck around forever - but this expectation is not realistic. So, if you do decide to cancel obviously we'll be very sad, but if you're intent on leaving then you'll be able to do so. Can I access my content on the membership site once I have cancelled? No. Your membership entitles you to enter the members area and access the content released prior and during the duration of your membership. If you cancel or do not renew your membership you will no longer be able to access the content inside the Journey. You sure can! Contact us to upgrade to annual membership any time. If there’s anything at all that you’re not certain about, anything we haven’t made clear, any concerns or questions then please do contact us and we’ll help you out.